The IntelStore (previously known as Uniquely Intel) was ran by BDA America Inc. up to 2009. The IntelStore offered Intel branded merchandise to employees and visitors at some Intel campuses and also at the Intel Museum in Santa Clara, Ca. 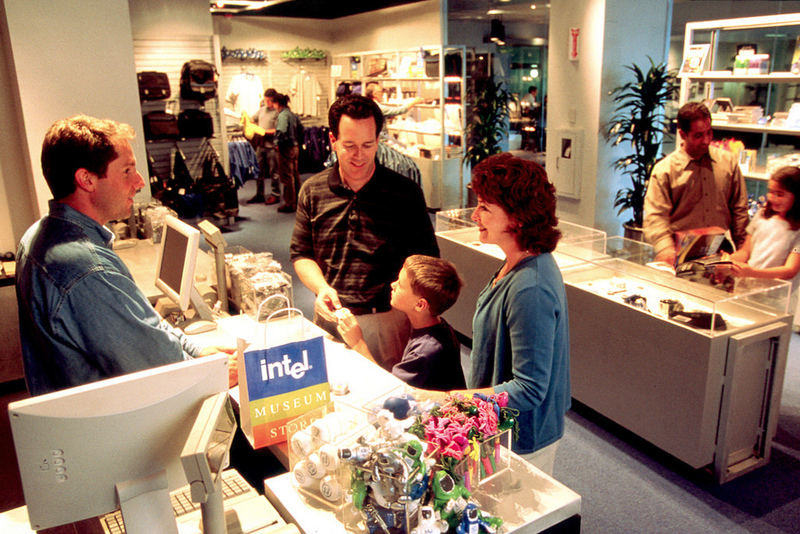 Intel currently only has one remaining Gift Store which is located inside the Intel Museum in Santa Clara (CA). Intel Employee site stores were once located at many other U.S. Intel campuses including: Chandler (AZ), Folsom (CA), Hillsboro (OR), Hudson (MA), Ocotillio (AZ) & Rio Rancho (NM) and some of their overseas sites. Merchandise made with actual embedded Intel chips were popular catalog items up until 2001 at which point the merchandise lineup went away from using real Intel chips as part of the items. Real chip items were re-introduced with a relatively limited product lineup in the Summer/Fall 2008 offerings. The 1996-98 period, when Intel introduced the Pentium II BunnyPeople merchandise, was the hey-day for Intel chip related collectible items. The IntelStore still exists today but their merchandise catalog is now strictly online only with no printed catalogs published. Catalogs and change of merchandise lifespan is typically 6 months. Most items are typically offered for around one year before being replaced by new items. BunnyPeople dolls however have been one of the few items continuously sold, they have been in the promotional lineup in one form or another non-stop since there introduction in fall 1997 until today. The IntelStore was originally called the "Uniquely Intel Shop". In 2003 the Uniquely Intel Shop was still being ran by BDA America Inc. but they changed their name and website and became known as The IntelStore. Their 2003 Intel merchandise catalog was offered via download from there website. Since 2002 the Intel gift catalog has no longer been available as a printed catalog. In 2009 BDA America Inc. ended it's role as the official Intel Store merchandiser and Robertson Marketing Group (RMG) took over operations. From 2013 until the present, the current IntelStore website offers Intel logo items from Staples Promotional products.